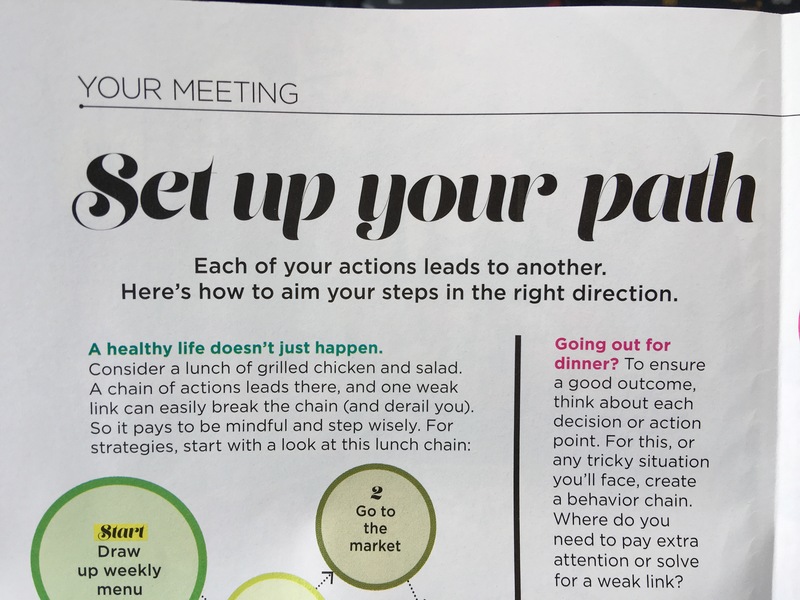 This week’s Weight Watcher’s topic revolved around “Setting Up Your Path For Success”. I like attending meetings here at Weight Watchers, for awhile I haven’t been going because of my birthday extravaganza. So they welcomed me with open arms once I stepped back in. Not to mention that I did gain some weight from the trip and wanted to get back into shape. So coming back was like getting together with your old girlfriends. They are like a support system like none other, as well as a boat load of knowledge with tips and tricks to help you through the week. The topic of this week was actually something that I’ve been doing as of recent, but didn’t really implement into my daily thought process. For those of you who are looking to shed some poundage, or even tone up for the upcoming summer vacation, then setting a plan needs to be at the top of your list. Planning is what everyone does before they start a challenge and making it fool proof is what you need to do in order to succeed. We were asked what were some things that we wanted to accomplish; one girl mentioned that she wanted to track her food everyday, another said she wanted to get her workouts in, and another girl said she was going to be going out to eat a few times this week and wanted to pick out her meals beforehand so she knew how many points she was going to be spending. Whatever the case is, my point is that whatever you’re doing, you know more about yourself than anyone. So whatever goal you set for yourself, just make sure that you take the extra time to think about what could go wrong in your plan to stop you from achieving your weight loss goal, and prevent what you can! For myself, I’ve signed up for TEAM Weightloss at my gym (basically a Bootcamp) and if you pay for the month, you only get 12 sessions, and if you miss ANY then there’s no makeups. So kiss your mulah goodbye, and I have this pet peeve of wasting money, so I can’t let that happen. One thing that I know that’s stopping me, is that I travel for work every month. So I plan on going to a branch out there and taking my classes so I don’t miss out, therefore keeping my goal. Make your goals at the forefront of your mind, and make moves in your daily routine to make them a reality. Think about the outcome, visualize your success and follow through with the steps in your plan. What are some goals that you want for yourself? Tell me I wanna hear! Post them down in the comments below!